One of the pioneers and the leading chain of indoor water park resorts, Great Wolf Lodge offers locations throughout the U.S. (and one in Canada to boot). All of the properties offer similar rustic, deep-woods themes, water park fun (of course), and a full-featured, resort experience. It’s a bit like a landlocked cruise ship, but geared to families with kids. In addition to the water slides, there are restaurants, spas (geared to both adults and kids), interactive game experiences for children and teens, storytelling, kids clubs, and other amenities. The locations vary in size and features. Part of Great Wolf’s appeal is that it offers a weatherproof getaway where visitors can don bathing suits regardless of the time of year. In the winter, the resorts can be particularly compelling for snow-weary folks in northern climes. They offer some of the benefits of a tropical vacation without having to travel to the tropics. Compared to most other water park resorts which open their parks to day guests and can become quite crowded, all of the Great Wolf Lodges restrict admission to registered hotel guests. As Great Wolf adds locations, more people are within driving distance of one. The following list of resorts ​is arranged alphabetically by U.S. state with Canada following at the end. Set to open in 2019, the Arizona resort will be located in the Talking Stick Entertainment District. It will include a large, 85,000 square-foot water park along with a 27,000-square-foot family entertainment center. Known as Great Wolf Adventure Park, the entertainment center will include arcade games, rides, and other attractions. The hotel will offer 350 family suites. Its lobby will feature a distinctive show that will incorporate digital projection mapping. Located in Garden Grove (next to Anaheim and not far from Disneyland) and part of the InternationalWest district, the Great Wolf Lodge California has a 100,000-square-foot indoor water park, 600 hotel rooms, an Aveda Spa, and a 30,000-square-foot conference center. It is the largest of the chain's water parks (and one of the larger indoor water parks in the country). The Colorado Great Wolf Lodge features a 50,000-square-foot indoor water park with attractions such as a Howlin' Tornado funnel ride, the Wolf Tail speed slide (which includes a launch capsule), and the Fort Mackenzie interactive water play center. Other activities include bowling, a ropes course, an arcade, mini-golf, and a climbing wall. Dining options include the sit-down restaurant, Barnwood, and the buffet eatery, The Loose Moose Family Kitchen. Located near Atlanta, the Great Wolf Lodge Georgia includes a huge, 93,000-square-foot indoor water park. Attractions include the River Canyon Run family raft ride, the Big Foot Pass lily pad walk, and Raccoon Lagoon, an outdoor activity pool. The resort offers 456 hotel rooms, along with a spa for kids, a MagiQuest interactive attraction, and a Flip Flop Workshop to fashion your own footwear. 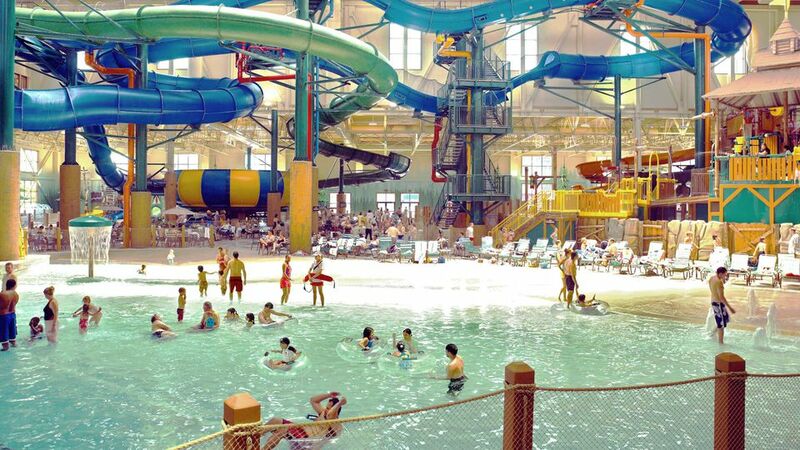 Located near Six Flags Great America, Great Wolf Lodge converted an existing water park resort. The park includes Double Whirlwind, a family raft ride, Coyote Cannon, a bowl ride, and Whooping Hollow, an area for young kids. Other activities include AtomicRUSH, a family game experience, 4D World, an interactive game, and outdoor mini-golf. At 40,000-square feet, the indoor water park at Great Wolf Lodge Kansas City may be comparatively small. But it has some great attractions, including the first-of-its-kind Triple Twist, a slide that includes three mini funnels. The resort also has 275 hotel rooms, an Aveda Spa, and a MagiQuest interactive attraction. The lobby includes the Great Clock Tower Show, an animated presentation that features Great Wolf Lodge characters. The Great Wolf Lodge in New England is located in Central Massachusetts, about 45 minutes from Boston. It offers a 68,000-square-foot indoor water park and over 400 hotel rooms. Before Great Wolf took over the property, it had been a CoCo Key indoor water park resort. Attractions include Howly Wood XD Theater, a 4-D motion simulator attraction. One of the smaller Great Wolf Lodge locations, the 38,000-square-foot indoor water park in Traverse City caters mostly to younger splashers. It does not have some of the more thrilling attractions found at the larger parks, such as a funnel ride or a water coaster. The Michigan resort offers 275 hotel rooms as well as a spa. Activities include Compass Quest, an interactive, high-tech adventure game. A converted property, the Great Wolf Lodge in Minnesota used to be known as the Water Park of America. (Which was a play on words of sorts since it is located next to the Mall of America.) Its water park is 75,000 square feet and 10-stories tall. At the top of the park is a slide that likely holds the record as the tallest in any indoor water park. The resort offers over 400 hotel rooms and suites. The large, 80,000-square-foot indoor water park near Charlotte features the Howlin' Tornado funnel ride and the Mountain Edge Raceway mat racing slide. The North Carolina resort also has over 400 hotel rooms, an Aveda Spa, miniature golf, and a MagiQuest interactive adventure game. Located next to the Kings Island amusement park (which also offers an outdoor water park in the warmer months) near Cincinnati, Ohio, the Great Wolf Lodge has a 75,000-square-foot indoor water park that features the Hydro Plunge water coaster. The Ohio resort also offers more than 400 hotel rooms and a spa. When the amusement park is open, Great Wolf offers a convenient place to stay overnight. In the offseason, it allows visitors to continue to have water park fun. Formerly known as the Great Bear Lodge, the Sandusky property has a 33,000-square-foot indoor water park and is one of the chain's smaller properties. It does not offer a spa, but it does feature a huge arcade. When nearby Cedar Point is open, the Lodge offers visitors a fun place to stay overnight. Located in the Pocono Mountains, the resort has a huge 78,000-square-foot indoor water park with a water coaster and The Double Barrel Drop, a raft slide with two mini funnels. The Pennsylvania Great Wolf also offers over 400 hotel rooms and a MagiQuest interactive attraction. With Aquatopia at Camelback Lodge and the Kalahari Pocono Mountains nearby, the resort has competition from other indoor water parks. The 80,000-square-foot indoor water park at the Texas Great Wolf includes a Howin' Tornado funnel ride, the Coyote Cannon bowl ride, and the River Canyon Ride family raft ride. There are more than 400 onsite hotel rooms as well as an Elements Spa. Activities include a ropes course, a lazer maze, and a large fitness center. Located on the Chehalis Reservation, the Great Wolf Lodge Washington has a 65,000-square-foot indoor water park with a family raft ride, a funnel ride, and the South Hot Springs whirlpool spa. The resort offers over 300 hotel rooms. Amenities include an Elements Spa, indoor mini-golf, a mining for gems attraction, and outdoor water activities. Located near Busch Gardens Williamsburg and Colonial Williamsburg, the Great Wolf Lodge has a 67,000-square-foot indoor water park with a funnel ride, a family raft ride, and a tube ride designed for two riders. The resort offers over 300 hotel rooms. Attractions include an Elements Spa, a MagiQuest interactive attraction, a 4-D theater, bowling, and a Creation Station where kids can make their own plush toys. Located in the indoor water park capital of the world, Wisconsin Dells, Wisconsin, the original Great Wolf Lodge boasts a 78,000-square-foot indoor water park with a funnel ride, the Lookout Mountain water slide, and a family warming pool. Activities include an indoor interactive children's role playing adventure, an Elements Spa, and a 3-D virtual reality theater. Located on the Canadian side of Niagara Falls, the Great Wolf Lodge has an 82,000-square-foot indoor water park. Thrill rides include Wolf Tail, a water slide with a nearly vertical launch from a chamber with a trap door. The resort features over 400 hotel rooms and includes miniature golf.